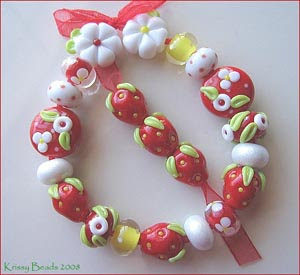 Krissybeads provided this sweet strawberry set for a very special client and will be transformed into a bracelet for mommy and a strawberry pendant for each of her two little girls. They pick strawberries when in season and have all kinds of little girl strawberry "gear", like strawberry sunglasses, so they just had to have more. A jewelry design project is always more fun when I have background on the buyer. That's why custom work is so much fun. Well, I finally succumbed to the flu, but it was very quick and over in about a day and a half. Today is a rest day and then it's on to finishing up Valentine pieces. I got to visit my 2 year old nephew last weekend and although his speech is still rather muffled, I found I actually understood most of what he was communicating..pretty exciting. My son is 20, so you can imagine how fun it is for me to go through these stages again, but as an aunt rather than a parent! Plenty of rain is falling here in California's bay area so it's a good day to be at home. PLEASE comment if you are actually reading this blog...otherwise it's like I'm talking to air. I need to know how many of you are out there...I'd appreciate it. Jessie and Payton, you KNOW you don't need to respond! 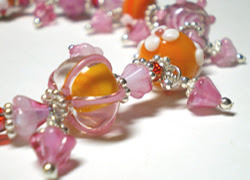 Just a little peek into what I posted today on Etsy.."Red Hots" and "Dreamsicle Garden" bracelets. Click on rockerjewlz.etsy.com to see more photos...and/or to purchase them. 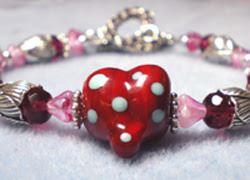 I absolutely loved working on these Valentine bracelets. The orange, pink and white beads were a special request from Michele and I had enough left for this second bracelet and I love them as a slightly off beat play on traditional valentine's day colors. My pmc silver materials are sitting in a special wooden box I got from my sis. Life's been getting in the way a bit so I've had to put it on hold, but it's all there ready and waiting for me, so you WILL see some work there. This weekend I get to visit my godson who's just over 2 years old...can hardly wait! I'll be checking email, so let me know if you need something special. There's still plenty of time for special requests. Keep coming back over the next week for more hearts and valentines. This is a peek into my Payton Jett heart collection. I'm turning these awesome spectacles into jewelry this week so they can be posted in time for Valentine's Day purchases. I've got reds, blues, greens, oranges...a huge array and not one of them looks like another. Payton is not one for duplication. 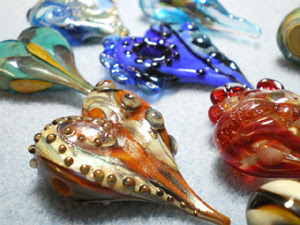 The thrill of making every bead unlike another propels her deep into discovering what glass can do at her hands. 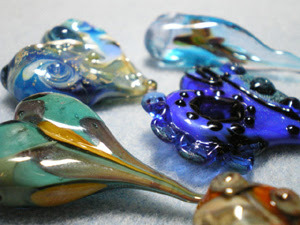 Now, of course, she fires spacer beads that are similar and can certainly make pairs and sets of one design, but the awe of the unknown is what keeps pulling her back to her torch....and I can hardly wait to see what she's going to do next! You can enjoy the wonder of obtaining one of her spectacular pieces next week, so be sure to stop by and see where her creativity led me. You can find her at www.greenglasscafe.com. 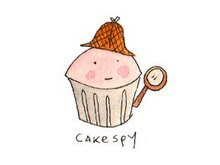 I just adore Cakespy. Jessie Oleson's blog about anything and everything cake and food related is simply fabulous. She writes with a sharp wit about her jaunts with her husband to seek out the latest and most unique food items wherever they travel. She generously posts her discoveries on her blog (like me on her January 15th entry), which has a double fold outcome: she dives into her passion for writing and the featured artists receive that all necessary item: exposure to the public! Jessie's peek into the world out there provides a most ingenious insight for us sitting at home staring at our computer hoping for a bit of spice in our day. Cakespy provides just that. If you love her blog, be sure to vote for Cakespy on the Blogger's choice award link found on her 1/12/08 blog entry. And you've just GOT to see her sweet artwork at http://www.etsy.com/shop.php?user_id=5243382. Via Etsy, I just sold 4 pairs of cupcake earrings to a new customer located in Italy...my first international order, how exciting! It's particularly fun because my mother's ancestors were from the northern Italian region of Genoa so I'm half Italian (other half Portuguese and possibly a touch of mutt). I seem to be getting more jewelry sold now that Christmas is over...when we all expect customers to NOT make purchases...so much for THAT idea! I seem to not want to work lately. I've been wanting to disappear from everyday life through reading and watching films. I just finished reading, or I should say consuming, "The pillars of the earth" by Ken Follett. (thanks for the recommendation, Dad). I absolutely loved it. I didn't want to put it down and that doesn't often happen for me. There is a follow up book...still in medieval times, but 2 centuries later, called "World without end" so I may have to check it out to retain that lovely immersion into literature. I can only think that my subconscious must need escape for some reason, although there is nothing looming or negative in my life right now...got any ideas on that? Oh, my toe is out of its protective shoe and almost back to normal. I haven't been able to take my regular walks yet but should be there soon. On the jewelry front, nothing new at the moment. I am currently seeking inspiration. My main source for that is Vogue magazine so I need to pull out the latest issue and soak it up to get me moving. 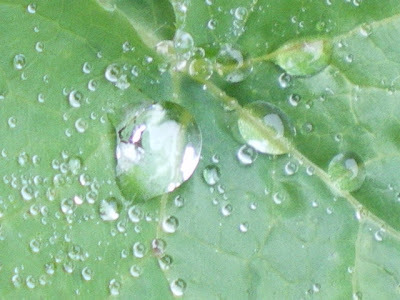 Dewdrops from our morning rain here in northern California. I haven't seen it rain this week, but each morning I wake to find it's rained in the early morning hours. These are dewdrops on leaves in my back yard. So, I've been very much NOT in the mood to create since the holidays...very odd...and I'm not sure why. I keep thinking if I pull out my bead collection, I'll find inspiration but it's not there yet. I guess this mood will work it's way and I'll come out the other side with some real beauties for Valentine's Day. I know if I pull out my latest issue of Vogue magazine, that will help set me straight. Thumbing through Vogue always thrills me. For me, it's about art, color, the play of light, and the hopes wrapped up in everything that is new, fresh and inspiring. Well, it's time to get back to work! With 10 days of vacation with my husband, then three days of work and a weekend, we are getting waaay too spoiled, but it's a nice reminder of what retirement will be like in a few years. We had a huge storm here in California on Friday and yesterday there was awesome thunder with very little lightning. One burst of thunder rolled on for nearly 10 seconds...that's a long time! Luckily for us, we are in a location NOT near a swollen river or ice or snow, so we never lost power or had to drive around fallen trees like much of the area did. On the bead front, I'm very excited to get "Shroud" from Payton Jett that you see displayed here. It's fat, loaded with hearts and very inspiring for Valentine's Day jewelry. I'm excited about what I'll be able to mix into it. 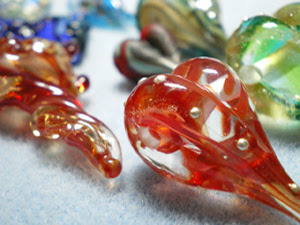 I'm about to dive into my lampwork heart collection, so you'll soon see what I create in that department. Be sure to visit me on Etsy at rockerjewlz.etsy.com. Our friend stopped by on New Year's eve with a bottle of bubbly. We had a marvelous chat on history, mostly about British royal lineage. This topped of our day of buying a new used car that we've long wanted and it was such a great deal and the salespeople were wonderful, not pushy at all. I mean, they wanted us to be happy, not pressured. My husband had 10 days off which means I was on vacation also. It was really nice to not work with jewelry or business for a while. Our son left town for the second half of vacation, so we had a nice reminder of what our impending retirement days will be like...nice. I picked up two projects during my break...one is jewelry and bead related, the other is managing my son's future acting career. I have a lot to learn about both but am totally excited about them. 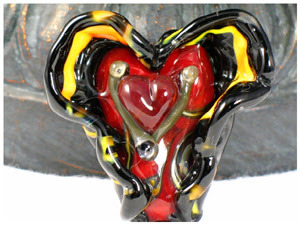 Now I have more to balance and have to focus on putting my awesome lampwork heart bead collection into jewelry for you in time for Valentine's Day.